Harris County commissioners will vote Tuesday on a controversial contract for the removal of public forest and excavation of ponds that will divert a modest amount of flow from upper Buffalo Bayou when it floods. Commissioners will at the same time consider approving hundreds of acres of new residential and commercial development on land draining into Buffalo Bayou through Addicks Reservoir, one of two overburdened federal dams on Buffalo Bayou in west Houston. An excess of stormwater flowing into Addicks as well as Barker Dam from Harvey in late August of 2017 forced the Corps of Engineers to open the floodgates on the two dams for the first time during a storm, causing massive additional flooding and deaths downstream on Buffalo Bayou. 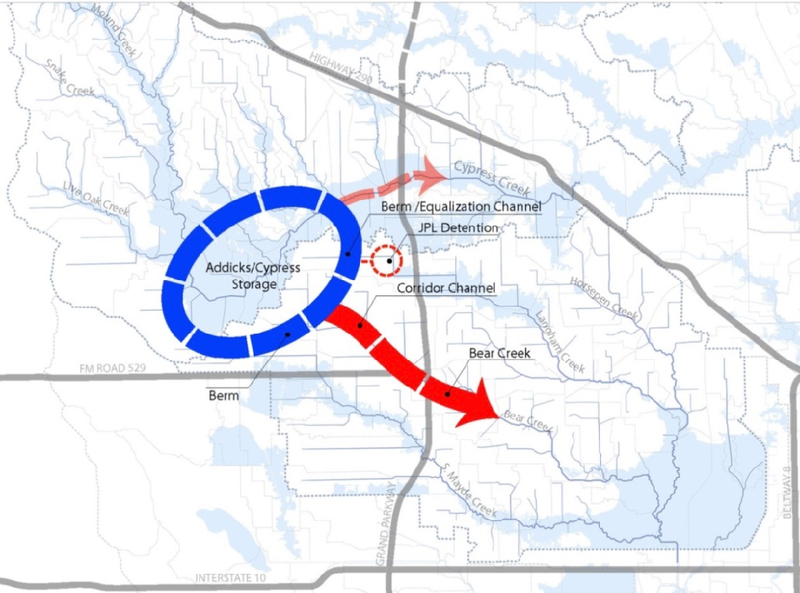 The area of development on both sides of the Grand Parkway (Highway 99) is near the general location of a proposed $300-400 million Third Reservoir that county and city officials have been advocating to reduce flow into Addicks Reservoir and Cypress Creek during storms. Thousands of acres of fields and farmland in the vicinity of Cypress Creek have already been platted for development. 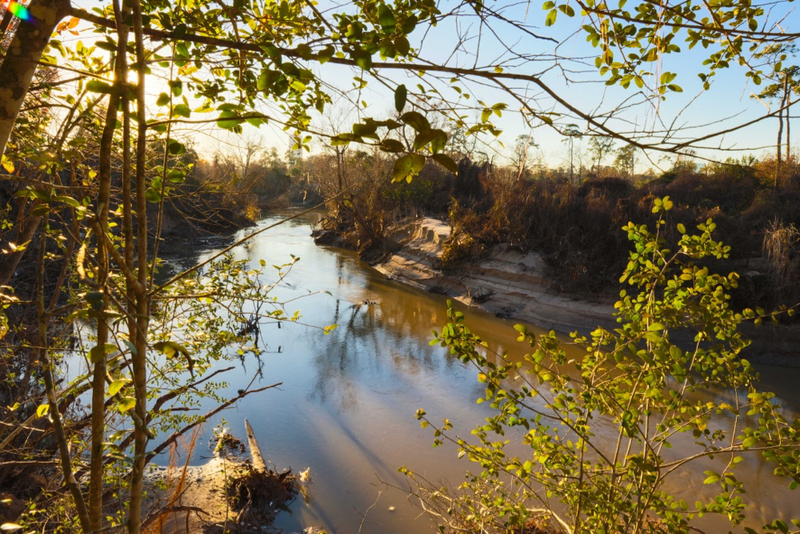 Save Buffalo Bayou advocates detaining stormwater before it enters a stream as well as the preservation and restoration of urban forests, prairies, and wetlands. A 2015 image of the proposal by the Harris County Flood Control District for the Katy-Hockley reservoir, known as Plan 5, below Cypress Creek. Like most of the rivers and streams west of Houston, Cypress Creek flows east towards the bay. Image courtesy of HCFCD. The detention basin project in Terry Hershey Park below the dams is part of a controversial plan that residents and conservationists have been fighting since around 2012. The plan was resurrected after Harvey caused major flooding of homes and businesses along the bayou both below and above the federal dams. Some property owners near the park blame the trees for flooding their homes. Terry Hershey Park is located along 500 acres of land owned by the Harris County Flood Control District between Highway 6 and Beltway 8. As part of a now generally abandoned approach to flood management, this stretch was stripped and straightened by the Corps of Engineers in the late 1940s as part of the dam project. Trees and vegetation have since grown back. The detention project initially would create two to three basins capable of holding some sixty acre-feet of flood water on the south side of Buffalo Bayou between Wilcrest and Eldridge, said Alan Black, director of engineering for the flood control district. More detention basins are envisioned. The original plan created some 280 acre-feet of detention. For context, the maximum capacity of the flood pools of Addicks and Barker reservoirs on government-owned land (not flooding development behind the reservoirs) is 213,124 acre-feet. Harris County Flood Control District 2012 proposal for detention basins on the banks of Buffalo Bayou in Terry Hershey Park. In addition to the $632,499 contract with RG Miller Engineering to design the initial detention basin plan, county commissioners are also likely to approve a $13 million contract to excavate the basins along Buffalo Bayou in this 6.2 mile stretch as well as remove sediment and make repairs in several miles of channelized streams flowing through developed land into Addicks Reservoir, which is north of Interstate 10. The initial survey of vegetation in Terry Hershey Park, a preliminary step to removing it, was begun in 2013. A new vegetation survey began in the fall of 2017. RG Miller engineers are expected to analyze the results of the vegetation survey as well as design the plan to remove the vegetation and excavate the detention ponds. Black said that the district is expecting to present the results of all these plans to the public between March and May. The Harris County Flood Control District is legally responsible under its 1937 founding charter for the “conservation of forests,” among other things. Trees and vegetation, including leaf litter, provide significant rainwater absorption and detention, as well as erosion control, among other vital ecological services such as cleansing the water. Oddly, it seems that detention basins in Houston are considered impermeable surface, apparently because they are designed with hard clay bottoms. This seems weird. The water should soak into the ground. So, if you build a detention basin, then do you have to build more detention to compensate for the impermeable surface of the detention you created? We’ll get to the bottom of this eventually. Harris County Commissioners Court begins at 9 a.m. at 1001 Preston Street, Suite 934, in downtown Houston. 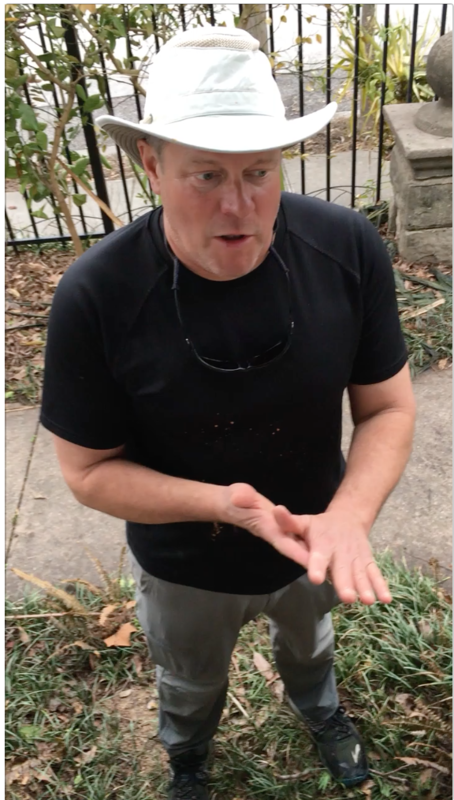 “Stewardship of Water” is the topic of an online talk by environmental attorney Bruce Bodson, president and executive director of Lower Brazos Riverwatch and advisory board member of Save Buffalo Bayou. The web discussion will take place Sunday, Feb. 25, at 6 p.m. This event is part of a monthly webinar series titled Sunday Evening Conversations on Creation hosted by Christ the King Evangelical Lutheran Church in Houston. Register here or contact Lisa Brenskelle at gcs.lrc@gmail.com for more information. Bruce Bodson, president and executive director of Lower Brazos Riverwatch and advisory board member of Save Buffalo Bayou. Great news! The US Army Corps of Engineers is doing a very smart and important thing. According to an article in the Houston Chronicle, the Galveston District office of the Corps is studying the whole system of drainage and flooding in the Houston region: where raindrops fall, how they move across rooftops and pavement and land, through drain pipes and into our bayous and streams, and ultimately into Galveston Bay. The project is called the Metropolitan Houston Regional Watershed Assessment. Edmond Russo, deputy district engineer for Programs and Project Management in the Corps’ Galveston District, told the Chronicle‘s Mihir Zaveri that the unprecedented study would also analyze how development has impacted flooding and where “chokepoints” are in the city’s drainage system. Russo suggested that the study would look at measures that individuals could take to reduce the time it takes for rain to run into our drainage systems. Slowing down the flow of rain runoff into streams is crucial to reducing flooding. The faster stormwater flows into a stream, the higher that stream will flood. Houston is behind other major cities that have shifted focus to managing flooding in place — stopping raindrops where they fall rather than after rain runoff floods a stream. There are 22 identified watersheds in the Houston region. Buffalo Bayou is the main river running through the city of Houston, with most other bayous and streams in the county flowing into it. Buffalo Bayou becomes the Houston Ship Channel and empties into Galveston Bay. In fact, Buffalo Bayou and many of the other watersheds in the region are part of the larger San Jacinto River watershed. A watershed is the area of land that ultimately drains into a particular water body. Houston has many creeks and ravines that have been covered up and even filled and flattened for development. Russo told the Chronicle that the study would cost at least $3 million and take approximately three years to complete. It requires congressional approval. Read about this in the Houston Chronicle. 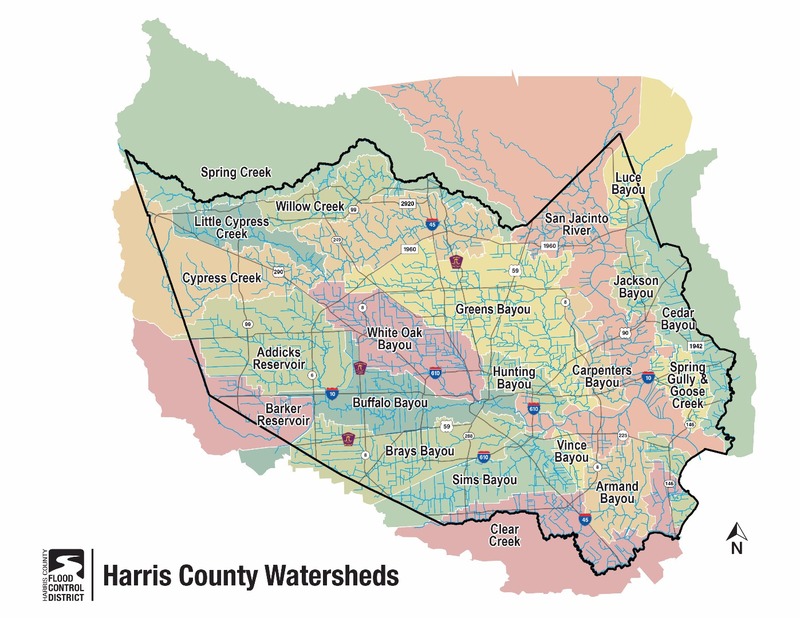 Harris County Watersheds. Image courtesy of the Harris County Flood Control District. We had to wait a while for a sunrise that wasn’t foggy. Finally the skies cleared, and just after dawn we headed through the woods of Memorial Park for our winter shot of that bend in the bayou that we have been documenting since the summer of 2014. It was cold! Barely above freezing. Fortunately Jim had brought some extra gloves for his assistant, who carried the tripod through the trees down the winding dirt path carpeted with dried sycamore leaves, carefully eyeing the leaning but stalwart trunk of the headless giant loblolly pine that had died in the drought of 2011. Several summers ago on this path we had encountered a giant rat snake curled up in the remains of a 100-year-old concrete pipe from the days of Camp Logan, the World War I military training camp that occupied the park before it was a park. No need to worry about snakes in the cold, pointed out Jim, as we stepped over a decaying log. Not that a harmless rat snake is anything to worry about. Jim, an expert naturalist, commented that the big snake was likely curled up asleep deep inside the shelter of the pipe. The landscape was much changed. It was winter, for one thing, so there was more visibility through the leafless trees and vegetation. Also there were fewer trees and vegetation, so much having slid and fallen into the bayou with the sloughing of the banks during and after Harvey. The bayou, flowing at about 600 cubic feet per second, was much closer to the path, the flooding river having washed down the banks while at the same time piling new sediment on top of them. We could hardly locate our regular spot, the bank was so changed. Our landmarks were gone. We walked back and forth looking for the angle, though we had taken a photo in October for our fall shot. To make things more difficult, the rising winter sun was shining directly into our eyes and into Jim’s camera. Jim was discouraged. Should we could come back later? But we waited, sheltering behind some yaupon branches. And eventually the sun hit the opposite bank, and Jim got his shot. See the entire series of A Bend in the River under Photos and Films. The year 2017 started off for Save Buffalo with our editorial in the Houston Chronicle warning against the folly of believing that cutting down trees and widening and deepening our bayous and streams is the most effective response to flooding. Nobody does that any more. It’s counterproductive, damaging, and costly. The practical focus is on stopping stormwater before it floods a stream. But in Houston developer and engineering interests as well as politicians continue unwisely to call for bigger and more expensive drainage pipes and “improving” our bayous and waterways at great taxpayer and environmental expense. Widening the floodplain would be a good idea, creating Room for the River, as the Chronicle has reported as part of its excellent series in the wake of Harvey. Save Buffalo Bayou has been talking about Room for the River, working with nature, for years. That means not building in flood-prone areas and buyouts of buildings in the way, among other things. Aerial photo of Buffalo Bayou flowing towards downtown by Jim Olive on April 7, 2017. The public forest of Memorial Park is on the bottom. Property of River Oaks Country Club is on the opposite bank. 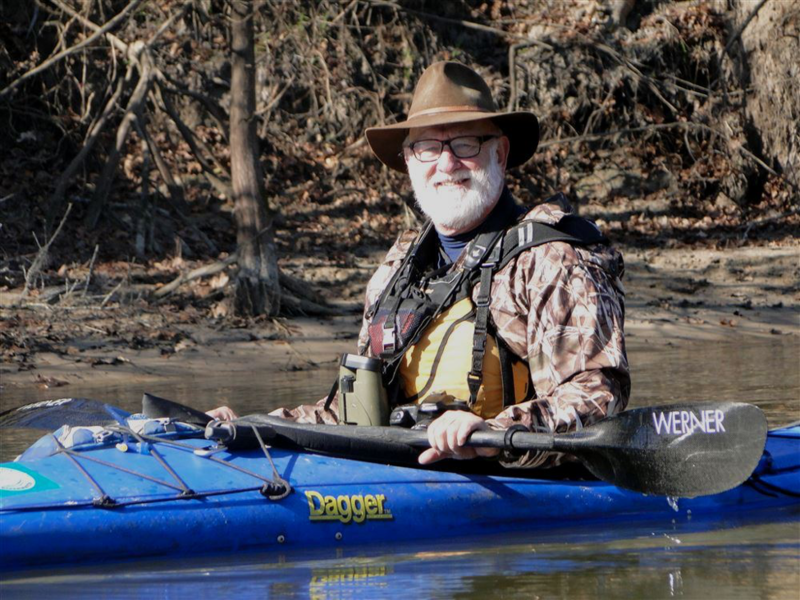 Then in January Terry Hershey died, one of Houston’s inspirational environmental leaders, a protector of Buffalo Bayou. 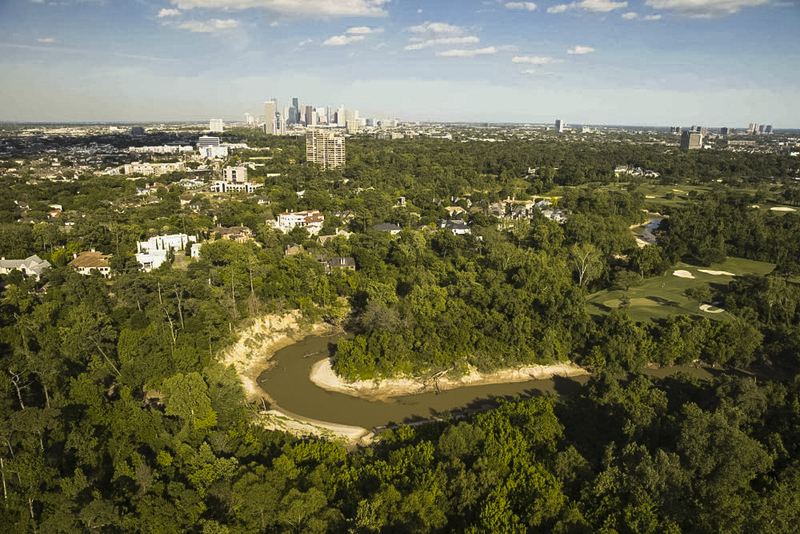 In April Jim Olive went up in the air and took a stunning series of photographs, including the photo above, of Buffalo Bayou flowing past Memorial Park and the Hogg Bird Sanctuary in the middle of Houston. You can see the photos here. You might also want to look at our series, A Bend in the River, documenting the changes in a bend of the bayou through the seasons. Later that month, after a delay of nearly two years following the last public comment period, the Army Corps of Engineers issued a permit for the long-delayed Harris County Flood Control District project to strip, dredge, and reroute over a mile of this stretch of the river, a historic nature area and one of the last forested, publicly-accessible stretches of the bayou. We asked and waited impatiently for the Environmental Assessment required by law. While we waited an amazing trove of bottles and broken glass from the early twentieth century surfaced on the bank below the high cliff on the eastern edge of Memorial Park, an area designated a State Antiquities Landmark. This high bluff and the rest of this historic area would have been destroyed by the flood control district’s “restoration” project. You can thank Save Buffalo Bayou that it wasn’t. 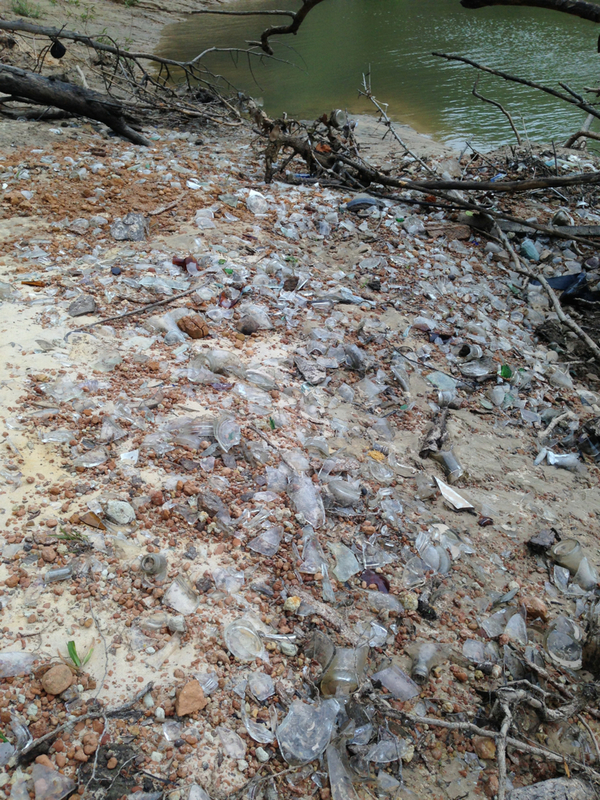 Broken glass bottles, probably from the trash of the World War I military camp that was once in the area, washed out on the bank of Buffalo Bayou in Memorial Park. Photo May 19, 2017.